— UW has held its last four opponents to 14 points or less. The last time that happened was in 1969. In 1975 and 1987, the Cowboys held four consecutive foes to 16 points for less, and in 2006 they held three straight teams to 16 points or fewer. — “It is cool, and the weather will be warmer. I will try to put on a show for family and friends, although I try my best every game.” — UW sophomore linebacker Cassh Maluia, one of 18 players from California on the roster. 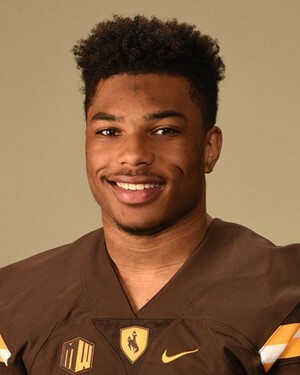 — UW sophomore cornerback/return specialist Tyler Hall is from Hawthorne, California, which is just north of San Diego. Hall was high school teammates with San Jose State junior running back Malike Roberson and freshman linebacker Tysyn Parker. Spartans freshman wide receiver Tre Walker went to a rival high school. “There may be a little chatter between us, but I’m just focused on coming out with a win and finishing strong,” Hall said. — Junior safety Andrew Wingard became the third player in UW history to record 100 or more tackles in three seasons. Wingard has 101 this season, and had 131 in 2016 and 122 in 2015. The others who have done it are safety John Salley (1980-82) and linebacker Jim Talich (1995-97). — “He’s taken move the from the WILL to the MIKE, and that was a smart move on our part. It puts him more sdleline to sideline. He has a better understanding of our defense and he’s a much more physical player.” — UW coach Craig Bohl on sophomore middle linebacker Logan Wilson of Casper, who played outside linebacker last season. Wilson leads UW with 105 tackles this season. — UW leads the Mountain West in both red zone offense and defense. The Cowboys have scored in the red zone 27 of 28 times, including 19 touchdowns. UW foes have scored on 24 of 32 red zone chances. The offensive and defensive marks are fourth and 15 in the nation, respectively. — The Cowboys also lead the nation in kickoff returns with a 29.58 yard average. However, they only have 19 returns. — “Our team is 100 percent confident in Nick, no questions asked. His play (last week) was solid. We had some turnovers we normally don’t have, and all of us as an offensive unit has to finish drives.” — UW junior tight end Austin Fort on junior quarterback Nick Smith. Junior quarterback Josh Allen remains day-to-day and will be a game-time decision on whether he plays against San Jose State. My gut tells me Allen won’t play. See Saturday’s Wyoming Tribune Eagle and Laramie Boomerang, and log on to wyosports.net as I delve into UW’s recruiting in California and how that has come along since Bohl and Co. arrived in Laramie. Also have a cool story on San Jose State junior linebacker Frank Ginda, who is a tackling machine. Also, I will have a live chat for the game, which will begin at 3 p.m. MT. Links to the chat will be on this blog and at wyosports.net. This entry was posted in Football and tagged Andrew Wingard, Austin Fort, Cassh Maluia, Frank Ginda, Josh Allen, Logan Wilson, Nick Smith, San Jose State Spartans, Tyler Hall, Wyoming Cowboys, Wyoming Football by Robert Gagliardi. Bookmark the permalink. How much has qb Tyler Vander wall handled the learning curve this year? That’s kind of hard to answer at this point. I can say he’s been the scout team QB most of this season and has taken few, if any, snaps with the regular offense during the season. How he’s handled the learning curve during meetings, film sessions, etc., really isn’t known as of now. Will look into it more as UW gets closer to its bowl game. Very good question, and thank you for posting it. Robert, think the only game this year the Pokes were out of sync was the Oregon game. Everything over hyped, from Josh Allen’s performance, NFL scouts in attendance, national TV media, etc. The rest of the games, Wyoming was dialed in, even if they didn’t win em all. Same should apply tomorrow, especially with the Poke defense. I am not gonna tell Granderson, Wilson, Epps, Dewey, Yohanna, etc. they are about to play soft against San Jose State– didn’t work too well with Elway! LOL! Nick Smith and the “new” offense should get some more game experience and score more than seven points. I too feel Josh Allen won’t play , don’t want to risk a 100 million payday! If Josh doesn’t play the NFL will question the health of the shoulder. This should be the game his talents really show making him look the best he has all season for the NFL. If the O Line doesn’t perform (five can’t block three last play of the Fresno Game) Smith or Allen will have problems and the game could go either way. Point spread keeps dropping. The Defense maybe Wyoming’s salvation.